Eyes-on-the-road Socks (tankelose.pdf) knit with scraps of Du Store Alpakka Sterk. Started March 28, 2010; completed April 1, 2010. 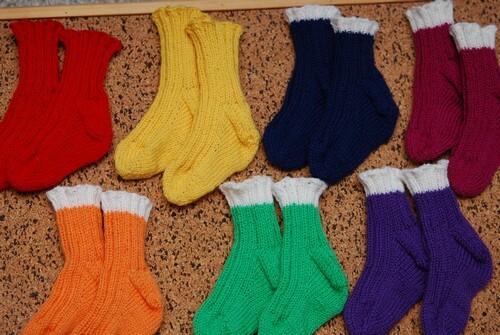 7 pairs of stashbuster toddler socks knit with scraps of Dale Babyull. Started April 1, 2010; completed April 9 2010. 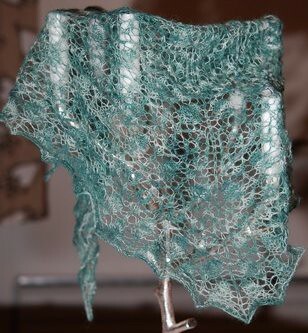 Prairie Rose Lace Shawl by Evelyn A. Clark knit with Cherry Tree Hill Suri Laceweight in the Jade colorway. Started April 10, 2010; completed April 17, 2010.